The Mac must obtain its IPv4 address from the local DHCP server. Note: “Subnet” and “Broadcast domain” are used interchangeably in this document. Inbound connections to TCP port 80 from any client must be enabled. This is usually done with the predefined “World Wide Web Services (HTTP Traffic-In)” rule. Inbound connections to UDP ports 67 and 69 from any client must be enabled. This is usually done with the predefined “Windows Deployment Services (UDP-In)” rule. In this scenario, the NetBoot server and the Mac are located in different subnets, which means that broadcast DHCP requests from the Mac can't reach the NetBoot server. To solve this issue, the administrator should set up DHCP Relay Agent on the client subnet’s router (R1), which will forward broadcast UDP traffic as unicast to the NetBoot server. Note: On the layer3-capable switch DHCP Relay Agent must be configured on Vlan interface with an IP address assigned, not a physical uplink interface. FastEthernet0/0 – the network interface on the router R1 which serves the User subnet. 172.17.2.100 – IP address of the NetBoot server. No other devices between the Mac and the NetBoot server require a specific configuration. The administrator should only ensure that HTTP (TCP port 80), TFTP (UDP port 69), and BootP/DHCP (UDP port 67) traffic to the NetBoot server is not blocked. 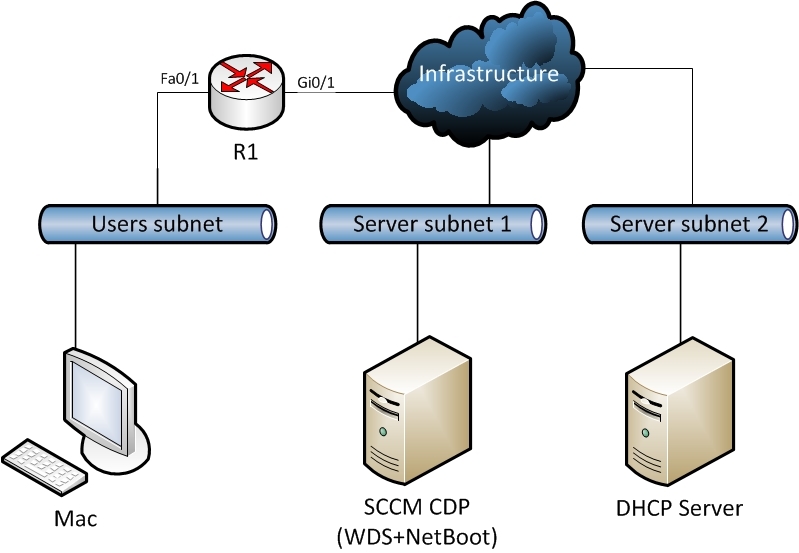 In this scenario, the NetBoot server, the DHCP server and the managed computer are located in different subnets, which means that broadcast DHCP requests from the Mac can't reach the NetBoot server. If your DHCP server is already set up – you’re already using DHCP Relay Agent. Just add a second server to forward DHCP packets to and make sure that the HTTP (TCP port 80), TFTP (UDP port 69), and BootP/DHCP (UDP port 67) traffic is not blocked by your firewall. If you’re planning deployment – you’ll need to set up DHCP Relay Agent, and set it to forward DHCP requests to two servers: DHCP server and NetBoot server. See Configuration 2 for more details on setting up DHCP Relay Agent.